You remember the Studio 360 challenge we helped launch a few weeks ago? A husband and wife design team were picked to present their concept on-air to Kurt Andersen. Hopeless romantics, you have a new way to express yourself come Sunday. And for all of us who can’t bear to face this most ooey-gooey of holidays, here’s a more contemporary way to celebrate it. Studio 360’s Redesign Valentine’s Day Challenge, which I helped launch a few weeks ago, unleashed hundreds of both warm and not-so-fuzzy solutions, but the show also enlisted married graphic designers Armin Vit and Bryony Gomez-Palacio of Austin-based UnderConsideration to create an entire branding package. You can hear them discuss their strategy with Kurt Andersen and see the entire system on their logo and identity blog, Brand New. Here’s the visual support behind some of their decisions. 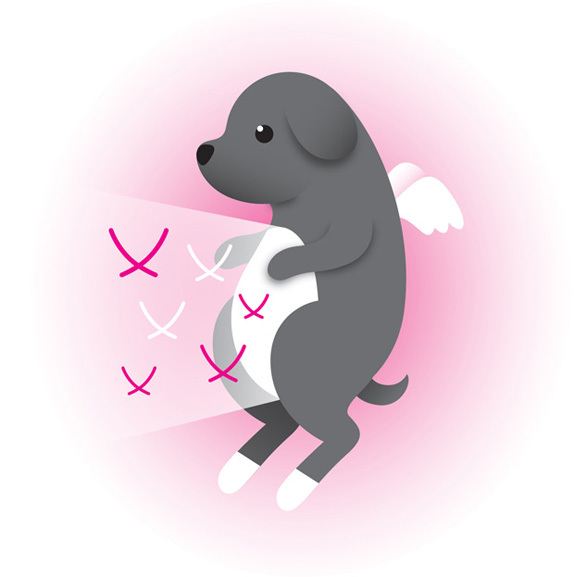 The heart symbol is not owned by Valentine’s Day. So they took the two major lines intersecting through the heart and turned it into its own symbol. The symbol can conveniently also be used in a variety of other real-life applications. 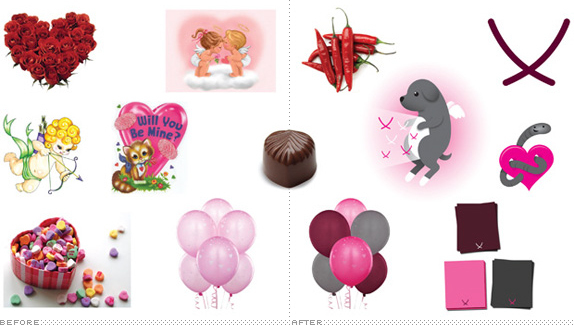 When it comes to a color palette, Valentine’s Day doesn’t own red (c’mon we just had Christmas) and pink is often that icky Pepto Bismol color. So they proposed a warm magenta and gray, which, when layered, create a lovely burgundy, perfect for a winter holiday. An imposed tax on all Valentine’s Day cards will lead people to start making their own handmade cards again. When it comes to the Valentine’s Day sweets, chocolate stays (as it should), but Vit and Gomez-Palacio suggest shifting the edibles towards fruits and vegetables which are healthier and known for their aphrodisiac qualities. Cupid also got the boot (they agreed he was creepy). So Vit and Gomez-Palacio tapped their friends Jessica Hische, Von Glitschka and Amanda Woodward to re-envision new mascots for the holiday. This was Hische’s Love Puppy. What do you think? You can vote on your favorite parts of concepts and see more work at Brand New. And you can even print out your own stationery created by Vit and Gomez-Palacio at the Studio 360 site.